Picasso, Monet Paintings Among Those Swiped From Dutch Museum : The Two-Way Seven works by famous artists were stolen by thieves who broke into the Rotterdam museum around 3 a.m. The thieves set off an alarm, but managed to escape before police arrived. 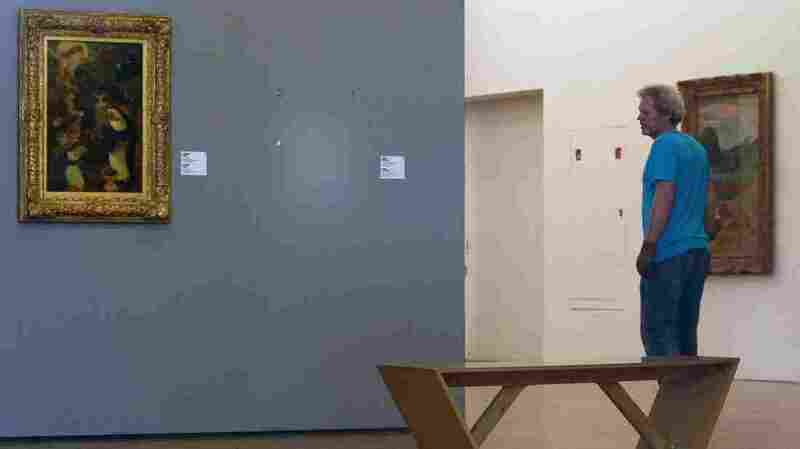 There's an empty space today where a Henri Matisse painting had been hanging at the Kunsthal museum in Rotterdam, Netherlands. Seven paintings were stolen Tuesday, including works by Pablo Picasso, Claude Monet and Paul Gauguin. At least the thieves had good taste. Paintings by Pablo Picasso, Henri Matisse, Claude Monet and Paul Gauguin were were among seven stolen from a museum in the Dutch city of Rotterdam before dawn on Tuesday. The thieves tripped an alarm at around 3 a.m. local time, but managed to make off with the works before police arrived just a few minutes later at the Kunstahl museum, The Associated Press reports. The alarm system was considered state-of-the-art and no guards were on duty at the time. The museum is exhibiting works held by the private Triton Foundation, and includes avant-garde art put together by multimillionaire businessman Willem Cordia, who died last year, the AP added. Chris Marinello, director of The Art Loss Register, which tracks stolen artworks, tells the BBC that the thieves knew which pieces to target. He estimates their worth in the hundreds of millions of dollars if they could be sold legally at auction. As stolen works, the thieves have limited options, such as selling them on the black market for a fraction of their value, or demanding ransom from the owners. The exhibit, which was closed Tuesday as police investigated, includes the work of more than 150 artists and opened just last week. The theft is being called the biggest art heist in the Netherlands since 20 paintings were stolen from the Van Gogh museum in Amsterdam in 1991. If you've ever wondered how hard it is to sell a stolen masterpiece, The Atlantic has this piece explaining that art thieves tend to be very good crooks and lousy businessmen.